The most commented upon moment from Peter Davis's Vietnam War documentary “Hearts and Minds” (1974) remains a show-stopper forty years later. Amidst a montage of Vietnamese citizens mourning the death of loved ones killed by American weapons (one despondent woman lowers herself into an open grave as others try to pull her back up), General William Westmoreland, interviewed in a placid outdoor Stateside location, explains, “The Oriental doesn't put the same high price on life as does a Westerner.” Score a win for the power of movie editing; the esteemed general could not look any worse, though he sure tries. Elsewhere, Westmoreland refers to Vietnam as “a child” that needs to be nurtured, apparently unaware that Vietnamese culture had a few millennia head start on America. The primary accomplishment of Davis's Oscar-winning documentary was to represent the people of Vietnam directly rather than through the calculated, racist terminology of the war's primary marketers. 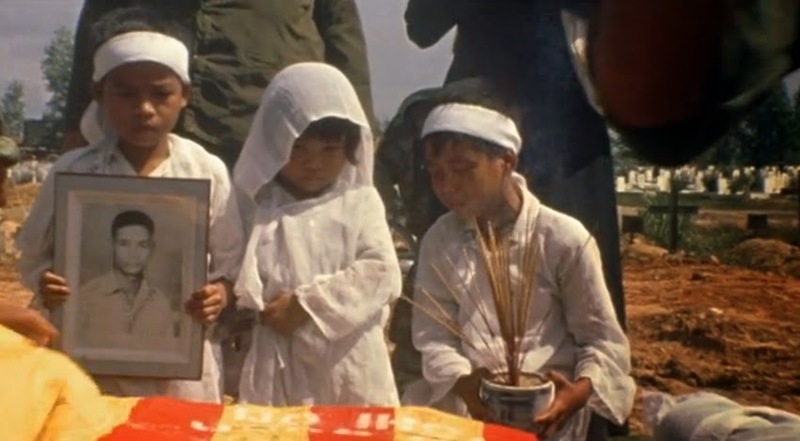 The powers-that-be wanted them to be portrayed as children or, even better, as “gooks.” The film showed them as humans. No wonder it generated so much controversy. The title derives from one of the catch phrases strategically employed by government officials. A clip used in the documentary shows President Lyndon Johnson emphasizing how essential it was to “win the hearts and minds” of the Vietnamese people. The slogan “hearts and minds,” repeated by many government representatives as part of an organized ideological campaign, was meant to refer to people “over there” but the film reminds viewers that the fight for “hearts and minds” was waged just as vigorously on the home front. Lt. George Coker, who survived six years as a prisoner of war in Vietnam, remains a true believer and exhorts a room full of American moms to raise their sons to be obedient so they can be ready to serve when needed. When we later see footage of an American soldier setting fire to a thatched roof in Vietnam, the clear implication is that it takes a village to raze a village. Other veterans like Randy Floyd, who flew 98 bomber missions, are much less gung-ho after their service. He remembers the pride he took in his highly-skilled work, but now struggles to justify the war and fears that the American public would rather forget than learn some potentially uncomfortable lessons. Unsurprisingly, Coker remains convinced that America won the war, Floyd and others are more dubious. A particularly dispiriting montage features a relentless parade of American presidents assuring the public that we have a vital national interest in Southeast Asia, though Eisenhower is the only one who inadvertently slips in an honest explanation not couched in fear-mongering or jingoism, noting that we can't risk losing a reliably cheap supply of tin and tungsten. Davis, like any documentarian, selects his subjects carefully and employs editing as a powerful rhetorical device, but he certainly doesn't view the war in partisan terms. It's just America's ongoing thing. “Hearts and Minds” is one of the most important war documentaries ever made, but the subsequent forty years of American military policy requires a consideration of how relative the term “important” is when talking about film (documentary or otherwise). The movie certainly did nothing to change American military policy, and I can't imagine Davis or producer Bert Schneider ever thought that it would. It still stirs the soul today, infuriates the viewer already inclined to be critical of military intervention, and provides a much-needed corrective to the official propaganda. That's a vital accomplishment by any standard, but it makes me wonder whether even the best documentaries can ever serve as hammers for social activism or if they can really only be mirrors. Maybe I'm just in a despairing frame of mind right now (no maybe about it, actually). Don't let that dissuade you from watching this eloquent, genuinely moving film. The film is presented in its original 1.85:1 aspect ratio. The film combines interviews shot in controlled environments with documentary footage shot on the run in Vietnam and is photographed both on 35 mm and 16 mm. It all looks consistently strong and the high-def transfer renders it all in sharp detail with a rich grainy structure throughout. This is a dual-format release with two DVDs (one with the film one with extras) and a single Blu-ray disc. The SD transfer has not been reviewed here. The linear PCM mono track is clearly mixed both in dialogue scenes and in war footage. Getting clean sound on documentary films is no easy task, but there's no sign of damage or dropoff in this sound track. Optional English subtitles support the audio in English, Vietnamese and French. 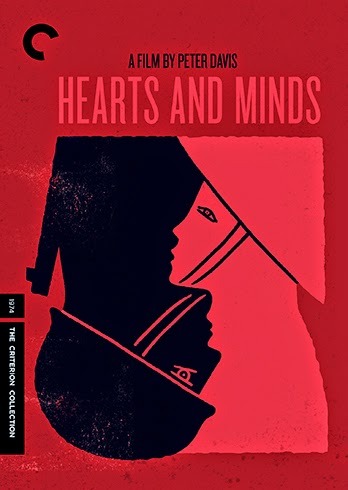 Criterion originally released “Hearts and Minds” on SD in 2002 and this dual-format release retains the previous spine number (156) . The old commentary by Peter Davis, recorded in 2001, has been imported from the SD release. New for this re-release (and included on both the DVD and Blu-ray versions) is over two hours of unused footage from “Hearts and Minds.” This includes interviews with Phillippe Devillers, Tony Russo, David Brinkley and others as well as a scene from a funeral in Quang Nam (a village accidentally bombed by American forces) and a scene set a hospital in Saigon. The thick 44-page booklet includes essays by Peter Davis (updated from the version included in the 2002 booklet), critic Judith Crist, history professor Robert K. Brigham, history professor George C. Herring (slightly updated from the one in the 2002 booklet), and history professor Ngo Vih Long. If you already own the old SD release of “Hearts and Minds” I don't know if the high-def upgrade and the two hours of outtakes are enough to justify a double dip. But it's an essential movie for anyone interested in the Vietnam War or in the ways in a documentary filmmaker can build a powerful argument.